“My Christian faith coexists happily with the largely Muslim culture in which I grew up” in the Middle East, stated counterfactually Grace Said while introducing the April 7 National Cathedral presentation “An Introduction of Islam in the U.S.” Said, sister of the late leftist academic and Arab/Islam apologist Edward Said, set the tone for an event before a conference hall audience of about 60 that glossed over the troubling Islamist and anti-Israel aspects of its participants. Such ecumenism did not extend to the Jewish state of Israel. Distributed printed material from the National Cathedral’s Palestine-Israel Advocacy Group (PIAG), chaired by Said, listed numerous anti-Israeli, even anti-Semitic groups as PIAG recommended resources. The far-left Israeli “human rights” organization B’Tselem (a Holocaust-denier once worked there) appeared alongside the Foundation for Middle East Peace. Its president, Matthew Duss, previously compared Israel’s blockade of the Gaza Strip to the “moral abomination” of “segregation in the American South.” Adalah, American Near East Refugee Aid (ANERA), Jewish Voice for Peace, the anti-Zionist website Mondoweiss, the discredited anti-Israel scholar Stephen Walt, and the anti-Israel Jerusalem Fund think tank (see here, here, here, and here) round out Said’s list. Anyone familiar with her would not be surprised by PIAG’s list or anti-Israel speakers such as Bishop Elias Chacour, Tent of Nations founder Daoud Nassar, or the Boycott, Divestment, and Sanctions (BDS) supporter Susan P. Wilder. Husain presented a tolerant understanding of Islam in accord with his previous writings (e.g. Islam’s “Prophet Muhammad taught…mercy toward all of God’s creation”). He referenced “no compulsion in religion” from Quran 2:256, oft-touted by Muslim apologists as a kind of Islamic First Amendment. Yet the traditional Islamic interpretation of this verse is far from freedom friendly. While Haddad noted a “tension in the Quran” between tolerant and intolerant verses, Husain countered that certain Quranic verses are bound to specific historical events. Husain asserted that only past Muslim zealots had practiced policies of “convert or die,” a view at variance with well-documented Muslim subjugation of non-Muslims. The Ayatollah Khomeini’s 1989 blasphemy death sentence against British writer Salman Rushdie (“I didn’t want to go there,” Husain responded to an audience question addressing this matter) supposedly contradicted everything he knew about Islam. He expressed gratitude (“Thank Allah”) that Rushdie remained unharmed thanks to his security, but left unmentioned Muslim murders of others associated with Rushdie. Haddad mentioned in her introduction of Husain that he had written about “Islamophobia,” and accordingly he attributed negative American attitudes towards Islam and Muslims to prejudice. He stated that the Southern Poverty Law Center (SPLC) “documents the rise in rightwing hate groups,” as if this hard left organization were an objective authority (one audience member entered the event carrying an SPLC publication). He also referenced media scholar Jack Shaheen, who has superficially argued that negative views of Islam and Arabs merely result from biases often stimulated by Israeli dominance of Hollywood. Husain’s statements follow naturally from his controversial past undiscussed at the National Cathedral. Husain was a two-term president of the Muslim Students Association (MSA), a Muslim Brotherhood (MB)-derived organization founded with foreign support from countries like Saudi Arabia (he has admitted this funding was “controversial”). Under Husain, the MSA website promoted donations to Muslim groups with funds legally seized in December 2001 on terrorism suspicions. He decried these seizures as post-September 11, 2001 “hype,” but after further media inquiries, the MSA removed the questionable internet links and Husain admitted an earlier “oversight” in May 2003. Husain is currently vice-president of the Islamic Society of North America (ISNA), an equally radical outgrowth of MSA. In 2014 he raised $200,000 for the Council on American-Islamic Relations (CAIR), yet another radical MB-linked organization. Islam Online, where he has been a contributor since its 1998 founding, is the creation of Yusuf al-Qaradawi, a highly influential MB-aligned sheikh. Husain’s National Cathedral appearance should worry Americans. 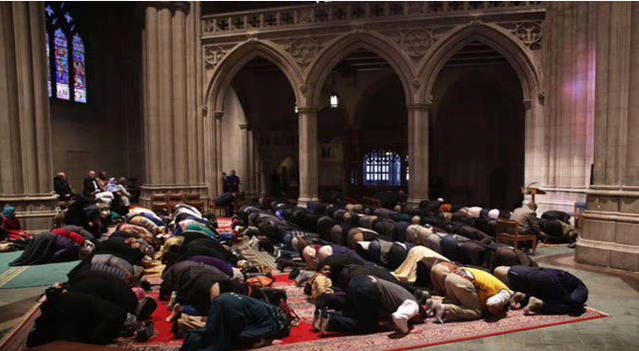 As the 2014 National Cathedral Muslim prayer service involving CAIR and ISNA indicated, this nationally revered (Episcopal) house of worship today often ignores dubious Islamic connections. 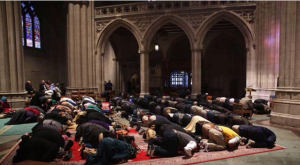 ISNA’s sharia-supporting Dr. Muzammil H. Siddiqi also appeared at the National Cathedral memorial service three days after 9/11, where his vague comments failed to condemn Al Qaeda terrorists. Simultaneously, scathing criticism of America’s ally Israel from Said and Husain, who stated as MSA president in 2001 that “Israel, for 50 years, has been an apartheid state,” apparently leaves the National Cathedral untroubled. The presence of President George W. Bush, Billy Graham, and others at the 2001 memorial service demonstrates the importance of the National Cathedral to America as a source of spiritual succor. Yet the National Cathedral appears to be not immune from the Episcopal Church’s ongoing decline (average Sunday attendance for the denomination fell 23% in the decade 2000-2010). In an ongoing modern era of jihad begun by the 9/11 attacks, America might very well seek solace again in the National Cathedral, only to find disappointment.